My favorite season of The Wire was the fourth one, during which the series followed the lives of Baltimore middle-schoolers Dukie (Jermaine Crawford), Michael (Tristan Wilds), Randy (Maestro Harrell) and Namond (Julito McCullum). It was a rare glimpse into the inner lives of young black men facing peril at every turn, and, of course, it was superbly written with depth and humanity. But I’d be lying if I didn’t say that the real reason I loved that season best was its opening, “Way Down in Hole,” interpreted by young Baltimoreans, the group DoMaJe. There was something about the purity of those kids’ voices that nearly brought me to tears each time I heard their remix of the Tom Waits classic. 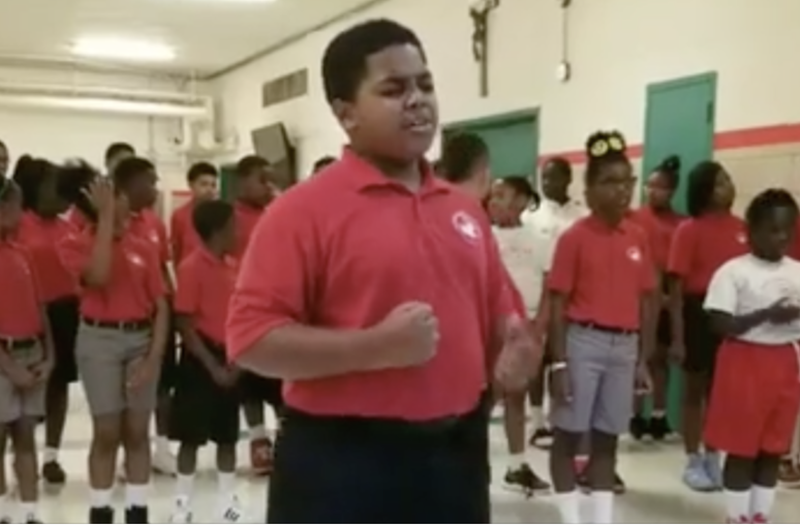 Recently, Kenyatta Hardison, the choir director of Cardinal Shehan School in Baltimore, decided to record her students singing on a Facebook Live video for the kids’ parents. In order of appearance, the soloists are Kai Young (sixth grade), John Paige (sixth grade), Bryana Hardison (fourth grade, and the teacher’s daughter) and Carlyse Blackwell (fifth grade). The performance for the gala featured a portion of the entire choir, which has nearly 100 members, Hardison said. All together, the video has been seen nearly 9 million times (the soloists begin at the 2:00 mark). Although Hardison humbly wrote that the song was “not perfect,” it was. Watch, weep and be joyful! We need some.